If you are looking for a memorable fun-filled holiday you will talk about for years, you've come to the right place! Vesna is a chirpy little thing, named after the ancient Slavic goddess of spring, associated with youth and the love of life. Come aboard, put your straw hat on and let the wind take you away. She is based in Sukosan, eager to set sail and wave hello to each island on your route. Pick your stops for splashing around, snorkelling, maybe even skinny dipping! Have a taste of local delicacies wherever you go, wash it down with a nice glass of wine, get a good night sleep and then do it all over again the next day! 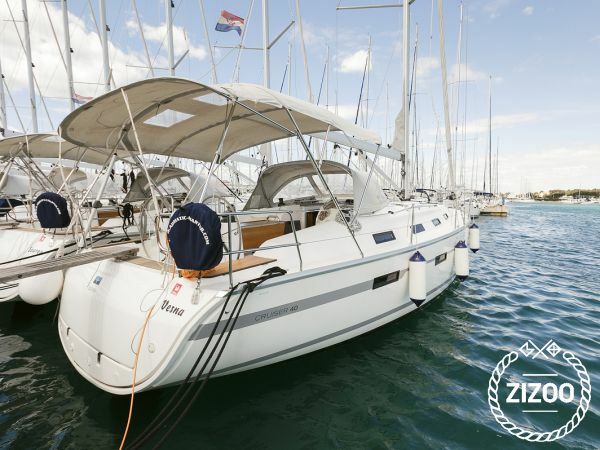 Get your crew together and make this 2013 Bavaria 40 your home for the week. 3 double cabins and the saloon sleep up to 8 people, leaving plenty of space for cooking, sunbathing and sitting around the cockpit table to recap the day. Adriatic Charter team look after their boats and guests alike, and they're quite good at it!